The Church of 8 Wheels is a roller skating rink located in San Francisco's Lower Haight district. The rink is aptly named - it formerly housed Sacred Heart Church for over one hundred years. I decided on the name for this series after a visit to the "Church" in November 2016. In the Christian tradition, the church is used as a gathering space for religious activities and worship services. In a more secular sense, the church serves as a place to find and build community. For much of African-Americans' history in the United States, the church has been a place to find not only salvation, but refuge from terror. I've roller skated on-and-off since I was about fifteen years old. My mother was a roller skater in New York City during the disco era and she introduced me to the art form at the tender age of five. I picked it back up in my teens and was then employed as a skate guard at my local rink for a few summers. In the past five years, I've rediscovered my love of roller skating and have been attending skate parties around the country. These are mostly photos from my travels. Skate culture is still mostly underground, but like most subcultures the community exists as its own world complete with different regional skating styles, custom skates, music, clothing, etc. It's its own little living and breathing ecosystem. If you don't roller skate then it's probably hard for you to understand why adults would pay hundreds of dollars and use their precious PTO just to roller skate. And that’s (one of) the biggest misconceptions. It’s not just skating - it’s community, therapy, healing, tradition, and creativity. It’s freedom. During a really good session, the DJ will play a track that just takes me. The song, my skating, and the people around me will move me into another realm. In those moments, this is Church. Welcome to the Church of 8 Wheels. Mia Lopez of Sk8 Mafia skates during College Night at World on Wheels. Los Angeles, California. A skater shows off his Intricately designed skates - a typical down South style. Kari Anne from Amsterdam and Florian Gravier from Paris practice together at Jardin Nelson Mandela for an upcoming show. Paris, France. Kari is the owner of Amsterdam-based skate school, Skate Dance, and Florian is the inventor of the on-the-go skate shoe, Flaneurz. 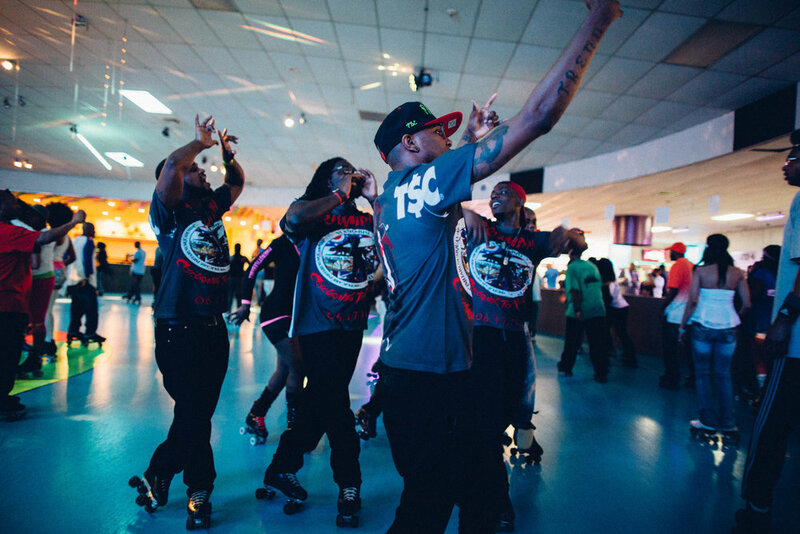 National skate parties include meet-and-greets, dancing events, cookouts, etc., in addition to the late night/early morning skate sessions. Two skaters ballroom dance at the Westin Atlanta Airport Hotel during Joi's Annual Sk8athon. Atlanta, Georgia. Ed takes a break to wipe his face during a session at Roller King. Roseville, California. Sk8 Mafia crew member, Bam Bam, skates during a Saturday night session at Fountain Valley Skating Center. Fountain Valley, California. 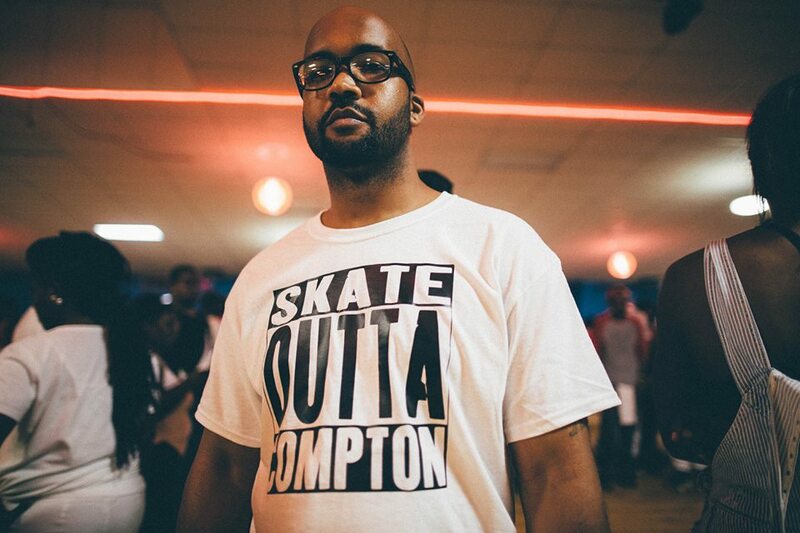 2015 saw the skate community re-imagine the "Straight Outta Compton" t-shirt designs made popular by the N.W.A. movie. Golden Glide Fun Center. Decatur, Georgia. Karen and her friend dance on the perimeter of the rink as DJ Mr. Magic looks on. Roller King. Roseville, California. A "survivor train" at the 8th Annual Rolling for a Cause skate party which raises awareness and funds for cancer. All skaters are encouraged to join this train, which is an event tradition. Branch Brook Park Roller Skating Center. Newark, New Jersey. Sk8 Mafia during the California section of Roll Call. 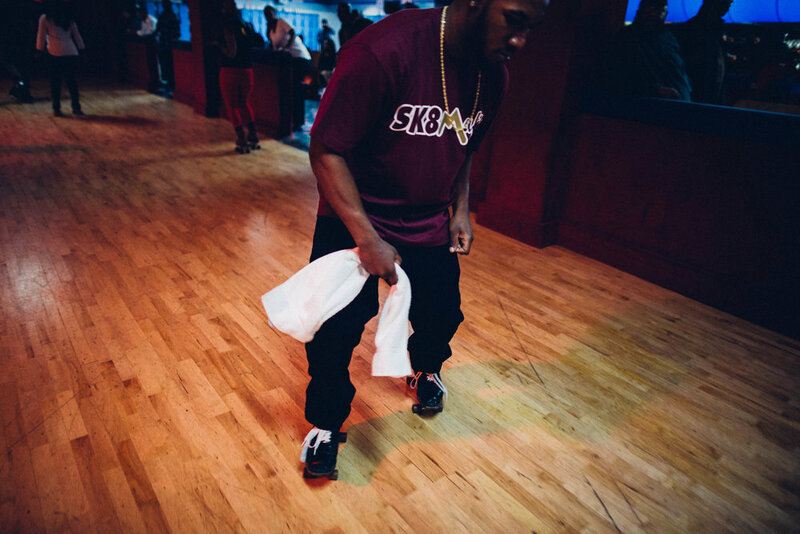 Every year, during Sk8athon's Saturday night session a "roll call" event takes place where skaters are called to skate for their city/state with accompanying regional skate music. Cascade Fun Center. Atlanta, Georgia. 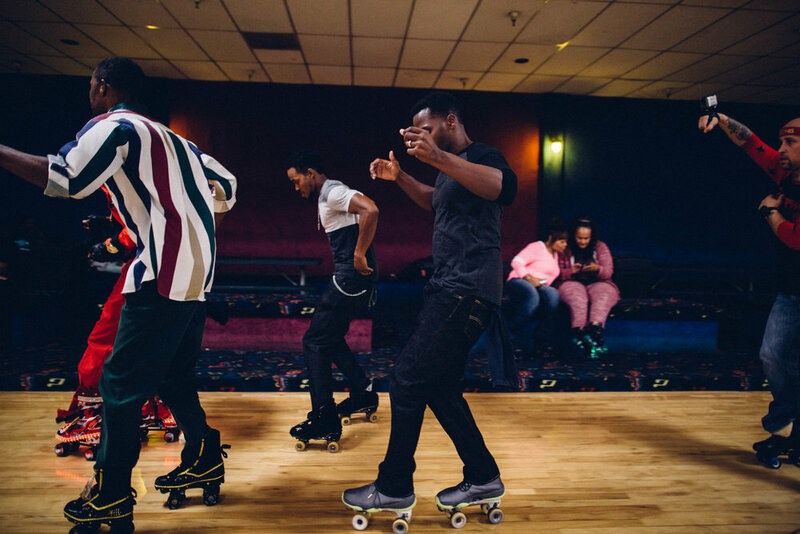 A dance battle erupts at a skate party cookout. Bransby Outdoor Family YMCA. Lithonia, Georgia. 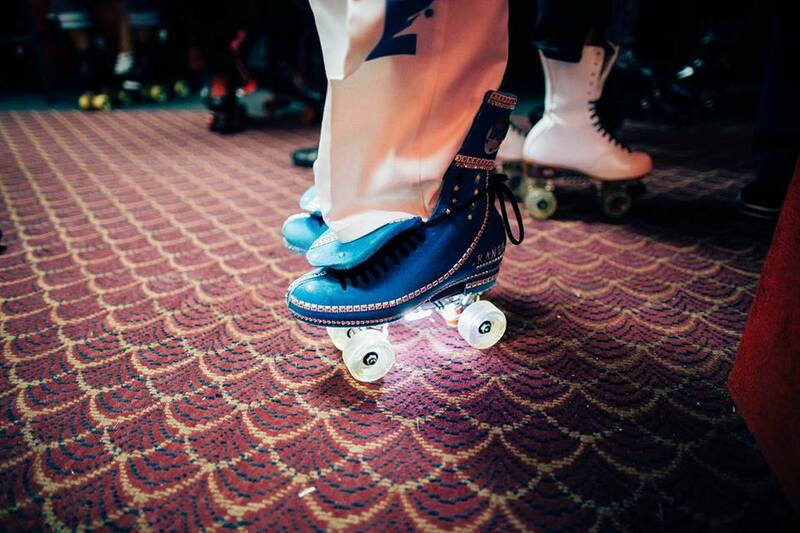 Ash, a skater from London, takes in the scenery at Cascade Roller Rink. Atlanta, Georgia. Group skating and synchronized routines are a popular part of skating. Roller King. Roseville, California. Nelson, Charlie and Richard perform a skate routine at the Venice Beach Skate Circle. Venice Beach, California.